Here we are again at the end of another era. In April 1985 as personnel officer I was involved in moving our factory to a new site on the Boucher road and in September this year I moved the company to premises on a new development near the City airport. Still in business and hopefully more profitable than this time last year. If we’re not I may be looking for a new job next year. Positive waves give me the confidence to believe this will not happen. Well it has not been a bad year all round. It will be memorable for me for the fact that we have finally given up caravanning and have taken to enjoying being looked after on holiday. Unfortunately this means that the dogs are spending more time in kennels. In February we took off to Egypt on a Nile cruise from Luxor to Aswan.Having been brought up between Jerusalem and Cairo I have always wanted to go back and see Egypt; Palestine, as a holiday destination, being out of the question for obvious reasons. Nothing you read or see on TV can equate to the sheer magnificence of the real thing. We had a guide for the week and visited Karnak, the Valley of the Kings etc etc. 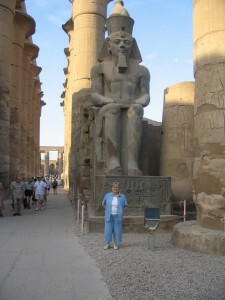 We also flew down to Abu Simbel at 3 a.m. to see the sun rise on the temple of Ramases. I took Josephine to Venice for her birthday in May. It is my favourite European city but have never got round to taking her before. We were lucky and got perfect weather so managed to do the whole sight seeing bit. Italian rail being what it is we took off down to Padua on the train for a day as well. Our final trip this year was to Dubai at the end of September. This was an unbelievable experience. Do not believe all the hype on it being the cheap shopping centre of the world. The only cheap place is the duty free at the airport and then only for tobacco and booze. Having said that we stayed at the Madinat Jumeriah complex, across the bay from the Burg al Arab hotel. If you want a holiday where you don’t have to lift a finger to do anything then this is the place to go. On the Sunday after we arrived it was the All Ireland football final and our party were invited to go down to the Irish Village (yes, there is an Irish quarter there, as there seems to be in every city in the world) where they had the match live on big screen. Needless to say, as Tyrone won, the celebration went on long into the early hours. Whilst there we also played Dubai Creek golf course. This is an experience in itself. High quality satnav on the buggies supposedly improves ones game – still cannot get the right club! On the family side the grandchildren keep on growing, (our near resident pair are now at the stage of trying to wink) and Peter continues to find ways to remain a long-term student. Nothing changes there then. He says he is working towards being a quantity surveyor, but I am still uncertain of what the quantities are that he is interested in surveying. On another bright note we have been to three 50th wedding anniversary and two 70 + birthday parties during the past six months. I am hoping that we will be able to follow in this tradition!! Just to prove that we still clean up quite well the photo below was taken at the annual Rotary charity ball last week. I have decided that I am too old to take life too seriously now so am trying to ease down on workload etc. Whether this works or not remains to be seen. I seem to get suckered onto committee and the like too easily. I told the golf club that this would be my last year as secretary so they have decided that I would make a good captain next year. How does one win? All in all I really cannot complain. We are both still blessed with good health (despite me back on the cigars again) and my handicap has been coming down steadily. What more could one want out of life.